A school teacher by profession, she came under the spell of Swami Vivekananda following his epoch making appearance at the 1893 Parliament of the World's Religions at Chicago. Five years later, she traveled with him to India. 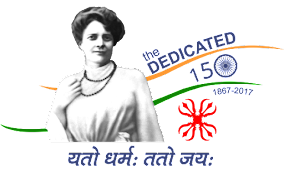 There she was initiated on March 25, 1898, and given the name Nivedita, "the dedicated. "While touring India with Vivekananda, Sister Nivedita, as she was known, saw with her own eyes the appalling conditions of ignorance, poverty and disease into which India was pushed by the alien rule. Her Irish blood boiled. As her first and foremost task in awakening the Hindu nation, she took up the cause of women's education and, with the blessings of Mother Sarada Devi, opened her school for girls in Calcutta in 1898. In 1899, Nivedita accompanied Vivekananda to England and America to raise funds for her school. When she returned to England, she found the agents of British imperialism engaged in a vile propaganda campaign against Swami and her. On her return to India in 1902, she addressed a meeting of youth in Madras and gave her rousing call to them to fight for freedom. The British government immediately blacklisted her. Though she plunged into nationalist activities with the blessings of Vivekananda, her action created anxiety in the Ramakrishna Mission circle. Immediately after the passing of Swami Vivekananda in 1902, she was asked to leave the mission. Soon she undertook a tour of the country to give shape to her plans. Nivedita met Sri Aurobindo at Baroda and persuaded him to come to Calcutta and take up the leadership of the nationalist and revolutionary forces in Bengal. Her school became a haven for patriots, revolutionaries, scientists, artists and journalists inspired by her thoughts and actions. "If the dry bones are beginning to stir, it is because Sister Nivedita breathed the breath of life into them," said Dr. Rash Bihari Ghosh, about her influence on the young patriots in India's freedom struggle. Her powerful pen stirred the hearts of Indian youth through her stories and editorials in patriotic journals.When Sri Aurobindo fell to the wrath of the British, it was Sister Nivedita who persuaded him to go into safe exile in Pondicherry, a French territory. Nivedita was not merely a patriot and revolutionary, but also a visionary and saint. She wrote on "Aggressive Hinduism," but not as that of a bully over a weakling. She spoke of the aggression and victory of character and spiritual power over human frailties and mundane interests, making the world a better place to live in. Her Cradle Tales of Hinduism is a gentle, nonviolent rendering of Hinduism's classic stories. In her vision, she saw Mother India guiding the destiny of a world to be full of peace and harmony. The enormous strain of her work affected her health. She suffered an attack of blood dysentery in October, 1911. Sensing her end, she wrote her will and left her possessions to the Ramakrishna Mission to be used for her school. On October 13, at about 7:00 am, Nivedita chanted the Upanishads, "Lead us from the unreal to the Real. Lead us from darkness to Light. Lead us from death to Immortality," and breathed her last. Today, in distant Darjeeling, there stands a memorial inscribed with these words: "Here repose the ashes of Sister Nivedita, who gave her all to India."